On July 31, 2018, the 303rd Anniversary of the historic 1715 “Silver Plate Fleet” shipwreck, Seafarer remembers the Spanish Galleon, The Santisima Trinidad y Nuestra Senora de la Concepcion. 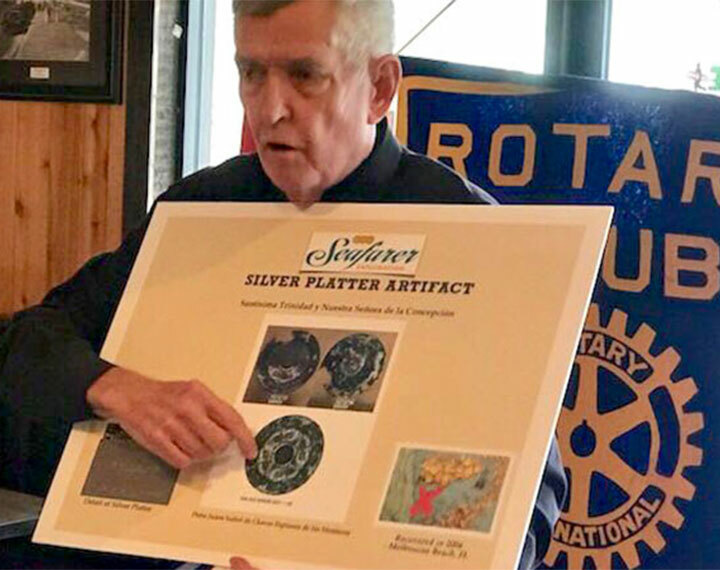 On Tuesday July 31, Mr. Kyle Kennedy, CEO of Seafarer Exploration Corp and distinguished Professional Archaeologist and author, Robert Baer gave a presentation to the Melbourne Beach Rotary at their weekly breakfast meeting documenting the progress of the shipwreck project –which by serendipity this talk took place on July 31, 2018, the 303rd Anniversary of the 1715 fleet disaster and the sinking of the Concepcion. The exploration and recovery process of the 1715 wreck which lies right off the Melbourne Beach Shore in shallow waters has been one of the remaining missing 1715 Spanish “Silver Plate Fleet shipwrecks. For over an hour the members of the Melbourne Beach business community and Mayor Jim Simmons enjoyed the wonderful breakfast served by Oceanside Pizza and were held spellbound by the history of the 1715 Spanish Fleet and in particular the insights on the The Santisima Trinidad y Nuestra Senora de la Concepcion, the company history of Seafarer, background of Kyle Kennedy, CEO of Seafarer and the current exploration endeavors at Melbourne Beach, Florida. In the early 1960s, in the shallows between Sebastian Inlet and Fort Pierce Inlet, the remains of some nine historic shipwrecks were discovered by Kip Wagner and his treasure hunting partners who became known as the Real Eight Corporation. These shipwrecks have been documented to be the remains of the Spanish 1715 treasure fleet that were lost in a hurricane or severe tropical storm on July 31, 1715. This extended area of south-central coast has become known as Florida’s Treasure Coast, and the salvage of these shipwrecks continues today. Over the past decade the remains of another colonial period shipwreck was discovered off-shore of Melbourne Beach by the group – Seafarer Exploration Corp and associates – who through artifact analysis have now documented that this is a missing 1715 fleet vessel named the Santisima Trinidad y Nuestra Senora de la Concepcion – referred to simply as the – Concepcion. The Concepcion wreck scatter does not lie in ‘association’ with the other 1715 shipwreck sites on the Treasure Coast, but lies some 16 miles to the north of Sebastian Inlet on the Brevard County- ‘Space Coast’. Artifact analysis and research in the Archives of the Indies in Seville by Seafarer researchers has led firmly to the identification of the shipwreck as the Concepcion. Archival sources confirm that the silver plates (Regalia) were consigned to the Concepcion and are listed on the manifest of the vessel as consigned by Don Francisco de Monteros. The Concepcion departed Vera Cruz Mexico on May 4th, 1715, and sailed to Havana where the vessel joined the returning fleet from South America before embarking on the return voyage to Spain. The combined fleet departed Havana on or about July 26-27, then sailed north along the Bahama Channel (Gulf Stream) where the fleet encountered a hurricane or severe tropical storm and was wrecked on July 31, 1715. It is documented in various sources, notably John Potter that at least six to nine historic shipwrecks lie along the Sebastian-Fort Pierce Treasure Coast. It may be that some of these listed sites are not from the 1715 fleet. The silver plates and the flintlock pistol that have been recovered tell a fascinating and tragic story. The owner of the plates, Don Francisco de Chaves Espinosa de Los Monteros, was returning to Spain from Mexico where he had been conducting business since his arrival in the port of Vera Cruz in 1712. One of the plates recovered off of Melbourne Beach is inscribed with the name, Dona Juana Isabel de Chaves Espinosa de Los Monteros. It is believed that Don Francisco and Isabel de Monteros were possibly husband and wife. A flintlock pistol found near the silver plates has the name of the maker, Ramirez on the firing mechanism with the date 1709 predating the shipwreck tragedy. It is known that Ramirez was a firearms maker in Mexico City during that period. Silver coins reportedly found on the beach nearby have all dated to the pre-1715 period. It follows that the shipwreck scatters off-shore of Melbourne Beach with the ‘diagnostic’ artifacts – all documented in the archives – is indeed the remains of a missing 1715 shipwreck Concepcion. Seafarer is also in possession of an archival list of the 1715 shipwrecks. This shipwreck list notes that 130 persons perished in the loss of the Concepcion, and presumably one of the victims included Don Francisco de Monteros who was returning to Spain with his cargo. Seafarer Exploration Corp is a Tampa based group, the CEO of Seafarer is Kyle Kennedy who has a long and successful history in the stock-market and hopes that the discovery and identification of this shipwreck will add to the considerable history of the Melbourne Beach and wider Brevard County history. Kennedy does not intend to market (for profit) any shipwreck artifacts but will unveil a new concept to monetize artifacts by keeping the archaeologically salvaged cargo intact. Kyle Kennedy is now in negotiation with the State of Florida Division of Historical Resources to recover one of the iron cannons from the Concepcion site that will be conserved at the Seafarer conservation laboratory in Melbourne. This facility will be periodically open to the public where the artifact conservation process will be shared with the wider public. Seafarer also intends to return the spectacular Monteros Plates to the Melbourne area to be displayed during a series of lectures that will illuminate the on-going archaeological salvage and history of the 1715 fleet and the Concepcion shipwreck site. The Seafarer Research Vessel Iron Maiden and experienced scientific divers are presently following the trail of shipwreck scatter off-shore of Melbourne Beach. The shipwreck scatter was once referred to as the ‘Radar Wreck’ due to the fact that the extended salvage site is off-shore of where a radar tower once stood. On calm days beachgoers can clearly see the Iron Maiden working off-shore. Kyle Kennedy and his crew – archeologist – project manager – and divers intend to share the on-going story of the Concepcion shipwreck with the Melbourne area community. It is possible that once the Concepcion cannon is conserved that it can be displayed in a local venue as a cultural site accompanied by a State of Florida Historical Marker. For further information, please contact Seafarer spokeswoman. Seafarer Exploration Corp. welcomes the opportunity to assist in fundraising events, lectures and show & learn events for community and business organizations, schools and public events.